A one-month-old baby boy was found on an Oklahoma City interstate with $5,500 cash stuffed in his car seat and a birth certificate. 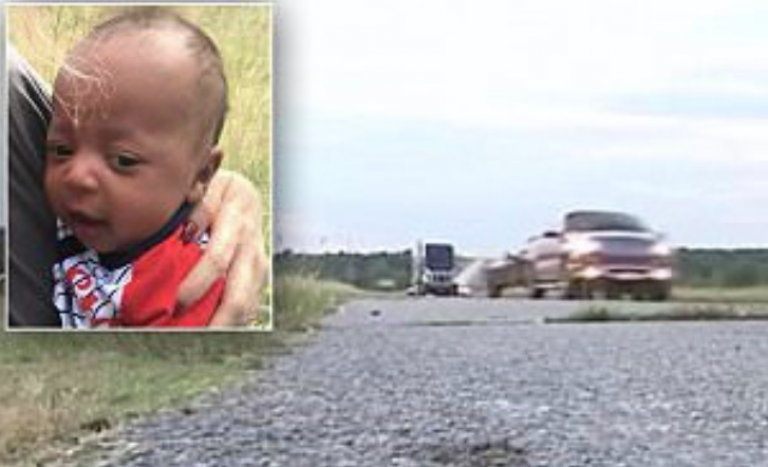 A church group found the baby abandoned in a car seat along I-40 in Oklahoma on Saturday. Roger Prater, the driver of the church group’s van, noticed a car seat on the side of the Interstate 40. He initially thought there was a doll inside, but he noticed two feet kicking inside and immediately pulled over and called 911. ‘You walk up on a baby on the side of the road, and you’re like: “Wow, you think you got it bad,”‘ Prater said in an interview with newsok.com. ‘It was not moving. Its eyes were closed. I thought, “Lord, don’t let this thing be hurt,”‘ he said. When Prater picked the carrier up and put it in his van, the baby opened his eyes. ‘There’s a baby here in a carrier,’ Prater told the dispatcher over the phone. Officers found a Social Security card, cash and a birth certificate with the baby. It was 91 degrees when the infant was found, but police said it’s unlikely the baby was on the side of the road for more than 30 minutes. The baby was in good health and taken to a local hospital for an evaluation. Family members helped located the baby’s mother, who was also evaluated at a local hospital. No names were released in the incident. A spokesman for the Oklahoma City Police Department said charges will likely not be filed.